Juvéderm is a biodegradable, but long-lasting injectable filler composed mostly of hyaluronic acid, a material found in the skin, muscles, and tendons in the body. The natural form of hyaluronic acid is liquid, a substance that the body metabolizes quickly. In order to make Juvéderm, the liquid form of hyaluronic acid is cross-linked so that the individual chains of the acid bind together, transforming the substance into a gel. As an injectable gel, hyaluronic acid adds structure and volume to the lips, facial wrinkles and folds. Similarly, Radiesse is a long-lasting injectable that is used for the treatment of facial wrinkles and folds. Its composition, however, is quite different. Radiesse is made of substance called calcium hydroxylapatite or CaHA, a gel that contains small calcium microspheres. Our own experienced plastic surgeon, Dr. Neal Goldberg, performs the treatment at our state-of-the-art practice. 3702	 Before After View Gallery Juvéderm® is FDA approved for moderate to severe facial wrinkles and nasolabial folds. Off-label uses of Juvéderm include lip augmentation, facial contouring, and so on. Made with a smooth hyaluronic acid gel, Juvéderm is a very popular product for non-surgical wrinkle correction. Radiesse® is a dermal filler made with calcium hydroxylapatite suspended in a water-based gel. It is also FDA-approved for moderate to severe facial wrinkles and folds, but plastic surgeons frequently use Radiesse for a wider range of cosmetic skin treatments, including facial augmentation and contouring. Dr. Goldberg might recommend Radiesse® for correction of marionette lines, nasolabial folds, skin depressions or for non-surgical nasal contouring and augmentation. Dysport® is a neuromodulator, exactly like BOTOX® Cosmetic, designed to halt excess muscle movement in the treated area for smoother, more youthful-looking skin. Dysport can last three to five months, and with maintenance treatment can provide extended results. Unlike fillers, Dysport typically takes a few days for the benefits to become visible. Restylane®, which is FDA-approved to fill moderate to severe facial folds and wrinkles and nasolabial folds, utilizes hyaluronic acid. Additionally, it may be used off-label for lip augmentation, marionette lines, fine lines, hollow tear trough and facial contouring. Restylane Lyft®, formerly called Perlane® is a thicker hyaluronic acid filler used for adding more volume to deeper folds deeper folds. This is often ideal for the nasolabial folds on a patient with heavier cheeks. Restylane Lyft generally lasts 6-8 months. Belotero® is an ultrathin hyaluronic acid filler used for fin shallow wrinkles. This is ideal for the vertical lines around the lips. It generally lasts 3-4 months. Voluma® s a brand new longer lasting ultra-thick hyaluronic acid filler used for deep volume filling. It is most commonly used in the upper and outer cheeks. Voluma lasts about 18-20 months. First the skin surface is cleansed with antiseptic, and a topical anesthetic is administered for comfort. For Juvéderm injections, topical lidocaine and ice packs are often applied for pain 5 minutes before and after injection. Dr. Neal Goldberg carefully selects the injection sites, administers Radiesse or Juvéderm, and then massages the area to guarantee a smooth effect. Both Juvéderm and Radiesse are injected into the skin’s subdermal plane using a linear threading, cross-hatching, or fanning technique. The particles in Juvéderm act as a platform for collagen deposition, and are slowly metabolized, requiring repeat treatments. Likewise, Radiesse promotes the production of new collagen in the body. Because of this, it is often the case that less Radiesse and Juvéderm are needed over time. Dr. Goldberg always does the most fabulous job with my injectables. I’ve been using him for years. He is warm, affable, and very highly skilled. He is always very honest about what I need and never tries to up-sell. I also know people who have had cosmetic surgery by Dr. Goldberg, and they all say the same wonderful things. Whats more, his rates are very reasonable compared to what’s around. I would strongly recommend Dr. Goldberg for anyone looking for a plastic surgeon. Directly after Radiesse or Juvéderm injection, the area treated may feel overly full or swollen. In the case of swelling, it may help to apply ice to the swollen area(s). It is recommended that patients refrain from strenuous exercise, sun exposure, and alcohol intake for the first 24 hours. The results tend to last for 6 -12 months, the time it takes for the body to metabolize the filler. Touch-up injections are, therefore, needed to maintain the look and feel accomplished. Side effects to look for include the following: redness, pain/tenderness, firmness, swelling, lumps/bumps, bruising, itching, edema, tenderness, and discoloration. To help you in your research, Dr. Goldberg has provided additional information by answering many of the most common questions about injectable fillers. If you would like more information, we invite you to schedule a consultation. A non-surgical approach to facial rejuvenation, dermal fillers can help address many common signs of aging, including wrinkles, volume loss, and mild skin inelasticity. Additionally, some formulas can help smooth scars, contour the face, and plump lips. Each type of dermal filler offers a unique selection of benefits. To determine the right product for your needs and goals, you should speak with an extensively trained injector like Dr. Neal Goldberg. Ideal candidates will be in good general health with a desire to address fine lines, creases, volume loss, acne or injury scars, and/or another aesthetic concern. Patients should also have reasonable expectations for results. It is our practice to provide information and guidance to assist you in your decision-making process. What are the most common types of dermal fillers? Broadly speaking, most soft tissue fillers fall into one of a few categories: collagen-based fillers, hyaluronic acid-based fillers, calcium hydroxylapatite fillers, and poly-L-lactic acid fillers. Collagen-based fillers were the first of their kind. They have become less popular with the advent of hyaluronic acid-based fillers (which include Juvéderm and Restylane). Both utilize naturally occurring proteins that can enhance the fullness and volume of the skin. Radiesse is composed of calcium hydroxylapatite, which is thicker than hyaluronic acid and can address deeper wrinkles and help contour the face. Sculptra® Aesthetic is an example of a poly-L-lactic acid-based filler—a longer-lasting injectable that stimulates collagen production. Who should administer the injections? While an injector is not required to be a medical doctor, choosing an extensively trained plastic surgeon to perform the treatment offers a variety of benefits. As an experienced plastic surgeon, Dr. Goldberg has a thorough understanding of all the soft and bony tissues of the face. He also has a comprehensive appreciation for facial aesthetics. With his knowledge and skill, he can deliver the fillers where they can provide the greatest advantages while minimizing the risk of complications. We believe the safest option is to choose a board-certified plastic surgeon to administer cosmetic injectables. Your comfort is one of our highest priorities, and we will make every effort to ensure your experience is as pleasant as possible. With dermal fillers, most patients report little discomfort and many formulas include a local anesthetic to help minimize pain during treatment. Any soreness should be minor and pass quickly. Side effects can vary somewhat between different filler formulations, but for the most part some mild swelling, tenderness, and redness in the treated area is normal, and these symptoms should subside quickly. In fact, patients often opt to undergo treatment during their lunch break. Dr. Goldberg will provide more specific information based on your unique needs during your initial consultation. Hyaluronic acid-based dermal fillers can provide immediate improvement in the affected area. Other formulations may also provide instantaneous results, while certain types require a longer activation period. Dr. Goldberg will discuss the expected timeframe with you during your first appointment. How long do soft tissue fillers last? Generally speaking, many fillers will last approximately six months to a year, but there are a number of notable differences between products. Juvéderm Voluma can last as long as a year and a half or more, while Belotero Balance often begins to fade in efficacy after about three or four months. Your unique response to treatment will also affect how long the results will last. During your first appointment, we will discuss the typical benefit length for the filler or fillers you are interested in and let you know what factors can alter these estimations. Additionally, occasional “touch-up” injections can extend the effects if desired. 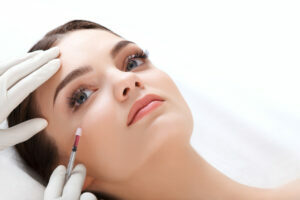 What are the limitations for injectable fillers? Cosmetic injectables can rejuvenate the face and provide significant reduction in the appearance of numerous common signs of aging; however, these formulas cannot replace plastic surgery procedures. Some issues cannot be adequately addressed with fillers, including moderate to severe skin laxity and some deeper wrinkles. Dr. Goldberg can examine your concerns and provide guidance about the best course of action based on your individual anatomic needs, desired outcome, and budget. For more information about non-surgical injectable fillers, call our office for a complimentary consultation at 914-840-5999.